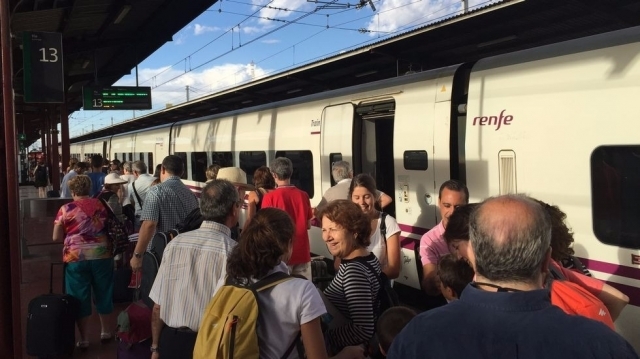 Renfe has announced that the Pilgrim's Train will return from Santiago de Compostela direction next summer with four departures from Madrid. This tourist train starts again exclusively during the month of August, following the itinerary of the Portuguese Way, crossing towns like Tui, O Porriño, Mos, Redondela, Arcade, San Amaro, Villagarcía de Arousa, Cambados, O Grove, Caldas de King, Valga, Padrón or Teo. The duration of the journey will be five days and four nights, picking up the train to travelers in Madrid, where they will be returned once the experience is over. The great novelty of this 2017 season is found in that the travelers of the tourist train will be able to obtain the compostela at the end of their trip, a document with which the Cabildo of the Cathedral of Santiago certifies that it has crossed the minimum distance of Way of Santiago . This is possible thanks to the fact that travelers are given the possibility to go through several stages on foot which altogether exceed the minimum required to obtain this document (100 kilometers on foot). The Pilgrim's Train, which offers travelers premium accommodation with breakfast, will accompany them on the pilgrimage at each start of the stage and pick them up at the end. In short, a way different from the traditional way we know to cross the Camino de Santiago, although it is not the only one. Since last season you can tour the Jacobean route by boat thanks to the Camino de Santiago initiative by sea. This route runs through 20 important Cantabrian ports and is recognized by the Archdiocese of Compostela, which regulates it so that pilgrims can seal their accreditation at different points along the route. Do you think an interesting proposal to make the Camino de Santiago?